For International Primate Day on September 1st musician Moby has teamed up with Animal Defenders International (ADI) to help Europe’s only native primate species, the Barbary macaque. Despite their endangered status under the Convention on International Trade in Endangered Species (CITES), Barbary macaques are often taken illegally from the wild for the pet trade or to be used as photo props for tourists. ADI is supporting a proposal to grant the species Appendix I status, the highest level of protection. See below to find out how YOU can help! 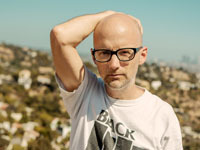 Supporting the campaign Moby said: "I refuse to stand by and do nothing as these endangered monkeys are snatched from the wild and their families for photo props and the pet trade. Barbary macaques need our urgent help and I hope governments will join ADI and ‘back the macaque’ and grant them the greater protection they need". Once widespread throughout Northern Africa, Barbary macaques now have only isolated populations in the mountains of Algeria and Morocco, as well as Gibraltar where the monkeys were introduced. The overall population has plummeted 50% over three generations (24 years), with numbers crashing to as low as 6,500 individuals. In the central Middle Atlas region of Morocco, the global stronghold of the species, average population density has declined by a shocking 50-80% over the last 30 years. Highly intelligent, emotional and sensitive, Barbary macaques live up to 22 years of age, in social groups comprising as many as 80 individuals, with males playing a primary role in caring for their young. They prefer high altitude cedar forests, but can also be found in oak forests, coastal scrub, and rocky slopes, feeding on fruits, tree leaves, and plants. The illegal trade - the species is the most seized CITES mammal in the EU, accounting for 25% of official live seizures - is pushing Barbary macaques to the brink. Please help stop unscrupulous traders from bartering with these monkeys’ lives. Donate to help ADI save endangered and threatened species. Having campaigned for over 20 years to educate the public about the use of primates for entertainment, research, and as pets, exposing the huge numbers of animals taken from the wild each year and the suffering of the animals during captivity and transport, the plight of the Barbary macaque is a cause close to ADI’s heart. Last year, ADI rescued more than 30 illegally traded monkeys in Peru during an 18-month mission against wildlife trafficking and to enforce a ban on wild animals in circuses. Over 100 animals were saved during the operation. Having nursed the monkeys back to health, ADI relocated new family groups from six different primate species to sanctuaries in their native Amazon habitats where ADI continues to fund their care for life. ADI previously rescued two Hamadryas baboons – one from a Bolivian circus and the other from the pet trade in Cyprus. They now live happily together at the Lakeview Monkey Sanctuary in the UK, where ADI funds their care for life, along with three macaques born at the notorious and now closed Israeli monkey breeder Mazor Farm. Born to wild-caught parents, Baloo, Betty and Boo were sold to a European research laboratory and used in neurology experiments. When the monkeys were no longer required, ADI stepped in to save them from being killed. With your help, we can rescue and relocate primates and other animals in need, providing them with the long-term care they require. Join our rescue team today and receive an ADI Rescuer Certificate, ADI Rescuer Newsletter, Rescue updates, Each year a beautiful ADI rescued animal photograph – suitable for framing, and more.